"Todd Dillon was AMAZING. We were not intending to use a broker as we have many friends in the industry and didn't have the heart to pick one over the other. My husband and I were going to go about buying a house on our own. We used Zillow and Trulia to find houses, schedule appointments, and attend open houses. 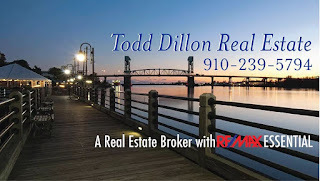 It was not until we met Todd Dillon that we knew we needed a broker and it needed to be him. We went to an open house and he was so knowledgeable, honest, straight forward, and professional. He answered all of our questions and did not make us feel pressured into using a broker. We were excited to have met him! We asked for his card and he scheduled an appointment with us that Monday to do some searching on MLS. It was a wonderful experience. Todd Dillon is a GREAT asset to the team. Dun & Bradstreet D&B sold my information to an offshore Marketing company which then sold it repeatedly over & over again. I get 3-7 calls every day since 8/2015 from funding companies. I hate D&B for doing that. Still getting calls every day. The calls are in foreign call centers void of federal prosecution using robo-dialers. The live agent doesn't have to authority to mark the number as on our national do not call list. After saying anything about not calling again, the number just gets put back into rotation to start the calling cycle all over again. Dun & Bradstreet has no control over what happens after the lead list is distributed. The numbers are spoofed so many of them appear as a local customer calling in. So blocking them doesn't work because the auto mated system the calls are routed through changes every time the call is made.So each time a new phone number appears. There's a whole lot of people out there who got screwed on the real estate bubble bust. Many couldn't afford the payments, banks failed to cooperate with borrowers, people became unemployed due to the crash, some even became sick from high levels of stress and frustration. Some declared bankruptcy. Some even led to divorce. Now where are all these people and what is the housing situation today? That answer is variable. Well the market has bounced back. Lending isn't as simple as it was. Appraisal reports are more strict. Many laws have been changed to help and protect borrowers from ever letting this happen again. Consumer confidence is at a generation high and homes are available. If you or someone you know is a prior victim of the housing crash and is now looking back at home ownership let me know. We confidentiality talk about the situation and see if we can help. Why live in Wilmington NC? I can't imagine why anyone wouldn't. Wilmington has the best of so many things. Four full seasons of Spring, Summer Fall and Winter. Two types of bodies of water, correction four types, The Atlantic, Cape Fear River, brackish water that the river and rising tide collide to make fresh and salt water down stream and small pods and lakes. If your into fishing or just being a part of life on the water, Wilmington has the best to offer. With very early settlers in Jamestown near Leland, Revolutionary War involvement, major local campaigns with the Civil War especially at Fort Fisher, a National Park, and the building of WWII ships down at the local river front, Wilmington has so much to offer. If you choose to go downtown, take advantage to the local tours.